As part of my day job I teach media literacy to children in 5th and 6th grade -- just before they go off to junior high school, and hopefully just before they are inundated with the maximum number of messages about who they should be. One of the things I did recently was to make two slide shows about the evolution of what is considered ideal in both male and female bodies. 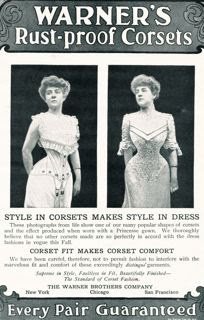 For the female progresssion, we start with the S-curve styles of the 1900's, with the impossibly thin waist and the "monobosom" pouter-pigeon chest. The thing I always debate with myself about this kind of image is this: is it better to rely on a piece of corsetry, torturing one's body into shape through lacings and bonings which everyone uses? At least then, no one expects you look that way naturally. Or is it better to be natural, wearing flimsy knitted clothes that give away every lump and bump, and be expected to be perfect with no structural support at all? The former is painful, but the latter can be even more painful, because the only way to gain the correct shape is to starve yourself, exercise to death, and have plastic surgery -- all invasive techniques that actually change your body and affect your overall lifetime health. And even then, after all that, they don't often work. Within about twenty years after this, however, the fashion changed so much that anyone with those kinds of curves is in big trouble -- which means that all the curvy women who were considered beautiful before probably had daughters who inherited their shape and were now struggling with trying to flatten and narrow themselves so as to fit the new shape. Within another twelve years, you have Mae West making that flat ideal look entirely silly. And then come the forties, time of slim hips and shoulder pads, a more masculine look to go with wartime and the Rosie the Riveter ideal of womanhood. But of course, men who are at war and dreaming of home think about girls like Betty Grable with longing: not so masculine looking here. Note, however, that there is no gap between her thighs. If she were a modern pinup, she would have much thinner legs, often so much so that there would be a space between the thighs. 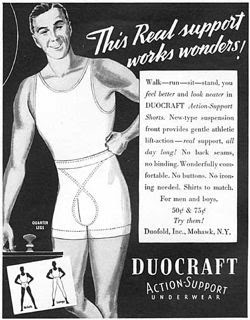 By the fifties, things had changed back again from the shoulder pads and the narrow hips. Then, in the sixties, a new phenomenon came to our attention: the new, "modern girl" look of Twiggy. Suddenly all those girls who looked like Marilyn Monroe were doomed. Thin was in (remind you of the twenties at all? Modernness and shapelessness?). This is, I think, the beginning of our modern supermodel/Photoshop hell. Curiously, though, this is where I started to notice a thing. It was a kind of big thing, and I'm not certain how I missed it before, except that with the proliferation of media, there are more examples for me to look at. What I noticed was a rift between the ideal woman for men and the ideal woman for women. 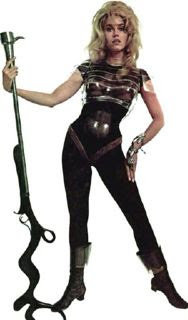 The thing is that while Twiggy was strutting her stuff to the women, we had Jane Fonda taking the male world by storm in her role as Barbarella. So what is that about? When women try to emulate someone such as Twiggy, against the general desire to attract men, what are they doing? My guess is that it's about women trying to impress other women. Which is an interesting phenomenon (Note: I am going to set aside gay, lesbian, bisexual and other preferences here because that is a huge discourse in itself; I'm making a choice to talk about the majority, in the services of a discussion of "popular culture," which is, after all, what the media is serving up. I do think it could probably be said that few lesbians are particularly interested in the Twiggy look, either, but perhaps I'm going out on a limb, making sweeping statements like that). Another thing I am fascinated by is the incredible strides we've made in the technology of beauty. These earlier examples didn't have the benefits of plastic surgery, personal trainers, and Photoshop. True, the early catalogs are all drawings, so could be as fantastic as you want; and true, they had the soft-focus lens and some retouching in still photographs. But when Ursula Andress walked out of the waves on film, she had to hold it in, to carry herself well in order to look as fabulous as she did. When I compare the photos of her to the apparently effortless beauty of the photos of her modern counterpart, Halle Barry, two things come to mind: "Poor Ursula! She looks so self-conscious by comparison!" --and-- "My word, but Halle looks disturbingly, almost supernaturally, flawless!" And, to be honest, it is supernatural: she has the benefits of all the modern technologies. Whereas Ursula was actually standing there, in the raw, being natural -- no "super" about it. The thing that disturbs me most about these two images is how our daughters must feel about themselves when they see them. The girls in 1962, seeing Ursula rising from the waves in Dr. No, knew that what they were seeing was a real woman, something they could aspire to (if that was what they wanted). Seeing Halle Barry, above, holds no such comforts, particularly when digital film has so much option for smoothing out those flaws. Such perfection is absolutely outside the realm of anyone who is honest with themselves. They might as well throw themselves against a brick wall, because you can't live, and breathe, and be that perfect. It's impossible, and our daughters know it. And I won't need to say much about the present Photoshop climate, and the overzealousness of Photoshop users that, while making fun of themselves to some extent, are also continuing to propagate the impossible image, one that makes it hard to judge what the real person looked like and so impossible to know what to compare oneself to. Now, on the male front, there's not a lot of change from 1910 to the 1970s. Maybe a little more muscle, but nothing strange. 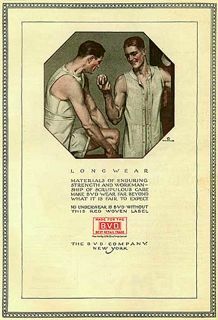 Male self-image, like male fashion, is one of conservatism and extremely subtle variation, particularly during the 20th century. Sure, there were the Ziggy Stardust exceptions, but very few men actually aspired to that kind of skinny and androgenous look -- or to wearing shiny, colorful stretch body suits and platform heels on the street. However, in the 1970s, not too long after Ziggy was blowing peoples' minds, a man who everyone had thought rather extreme, crossed over from the bodybuilding subculture into the mainstream media, bringing with him a sea-change as he came. It's true that his first big role in film was one of extreme caracature, and many people laughed at its comic book qualities. But the film, and his role in it, captured imaginations too. 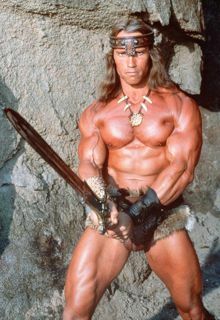 Arnold made his next appearance in another, more serious role, one in which his physical attributes are used in a much more believable way. ...to being impossibly badass, and that, right there, is an entry into the imagination of the male populace. 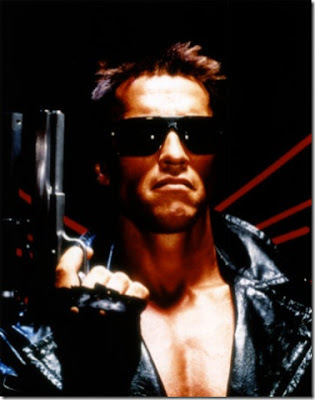 From there it was on to action movies, and before you know it, others were emulating the look. It became de rigeur for action movie heroes to have that pumped-up look; and a whole generation of boys grew up with the idea that it was the ultimate in masculinity. Just look at GI Joe. 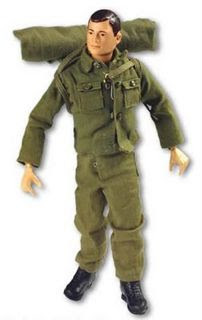 In the 1960s he was a regular guy, modeled to look like a grownup version of the boys who played with him. But by the 1990s, with G.I. Joe Extreme, whose biceps are nearly as big as his waist, it began to get out of control. Boys were being encouraged to play with role models that not only went beyond anything they could achieve with steroids, but would require actual muscle implants to achieve the proportions. Curiously, women didn't go along with this, just as the Twiggy thing never caught on with men. The Brad Pitt of Thelma and Louise, which appealed to so many women, is not the same one as the Brad Pitt of Fight ClubTroy, an action movie. And yet, just look at Robert Pattinson, the male star from the recent Twilight movies, who is the romantic fantasy outlet of hundreds of thousands of girls across the world. 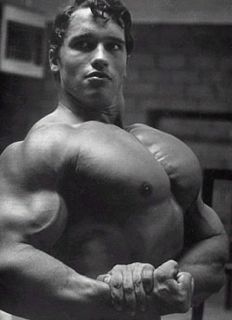 A farther cry from the Arnie physique I can really not imagine. I can't save the children I teach from the poor information and misleading imagery they are fed every day, but I can try to make them aware of the visual diet they are ingesting. We work in Photoshop, and they learn to do retouching themselves, which gives them not only a technical tool but a deeper understanding of how these images are remade, so that when they see an image, they can look for the telltale clues. Hopefully, they learn that there is really no way to make ourselves as perfect as the images we see -- and, in fact, they may even question who we are trying to make ourselves perfect for? As Jean Kilbourne says in Killing Us Softly 3, "We learn from a very early age [from advertisers] that we must spend enormous amounts of time, energy, and above all, money striving to achieve this ideal, and feeling ashamed and guilty when we fail. And failure is inevitable." And here's a nice article on the changing standards of body image for men. Fantastic article. Some really good observations on fashion and body types. While woman have been under extreme pressure for at lest the last fifty years, it's just recently really starting to catch on with me. More and more high school boys are taking hormones to help build bigger, stronger, faster bodies. And I think we're really going to see some health issues in the next ten to twenty years because of improper cycling and support of said hormones. well-said. it's nearly impossible in this culture to be happy with one's body, and raising children to accept & appreciate their bodies is insanely difficult. fashion so often holds up a mirror of cultural values & beliefs about what it is to be human, to be male or female, and what we value as a society...rather scary to contemplate that! Your students are very lucky to have someone like you to guide them. There are so many unreal images of women out there. I agree- women are competing. The average male would think "she is hot!" from everyone from Twiggy to May West. 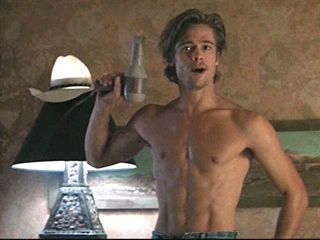 I think Brad in Fight Club got voted to number one as a male ideal body. I sure think it is. There is a wonderful book called Extreme Beauty from MMA. Deals with this. I am so glad you are teaching this. I had a teacher spend time throughout the year on deceptive ads and the motivations behind them, which gave me the tools to see it all objectively. Including the manipulation of female images. That was 40 years ago, and I still use that understanding. This should be part of every school's standard curriculum. I expect its not what you're expecting to hear, but dare I suggest that you are missing the point and perhaps even misleading the children? What if, just what if the functional purpose of the representational art in fashion is not to depict real people so much as to draw the attention to archetypal constructs? Wouldn't then the questions the viewers ask change from "Why can't I be like Halle Barry Enhanced?" to a far healthier inquiry, "How can I see those attractive features in myself?" or better "How can I see those romantic features in my own partner?" intended as a document of the model's state, but as a document of what is beautiful?, ie it is about asking questions about what and who we are as human beings, what makes us tick, as Marcel Duchamp said, about seeing seeing, about understanding the mechanics of our perceptions. Ursula and Halle are both undeniably attractive to the hetrosexual male, but in different ways; they highlight different aspects of the miracle of the visual-geometry of the female form (speaking as a male here of course ;) Twiggy too, has a vulnerable cute-ness that one can see in the eyes of so many women, and the whole reason she is the supermodel is because that look can be seen in the eyes of all her urban London cultural contemporaries. As they say in the trade, she has the look, she has the zeitgeist that is shared across the most fashion buyers and those they are trying to impress. She doesn't have a unique look, she has a universal look, her task is a unification of women. Sweeping generalizations are dangerous of course, but I think the real purpose of fashion isn't to replace the un-photoshopped everyday people, but rather to draw us into looking at the ordinary with new eyes. Let me maybe put this into perspective by appealing to a different media: does any young boy of antiquity to now truly believe he could be as heroic as Ulysses? Does that make Homer complicit in portraying an unattainable image of male-ness and honour that should be dismissed with distain? Or are we all on an Odyssey of our own, following our own universal hero's quest, and if so, does that archetypal story of Ulysses help us see our own strength, courage and determinations? That is Brad Pitt from Troy, a not very widely accepted or enjoyed movie. Brad Pitt from Fight Club Looks like the 1st one, if they beat the beejessus out of him. The other male lead is also of that smaller body type. The Female lead is skinny and whacked out on drugs. Not a good example of your points. There is an inaccuracy in the fourth paragraph. A person does not inherit a physical characteristic of their parent if it was one that was unnaturally forced on the parent's body. It's not actually in their genetic makeup, in other words. Great article. I'd encourage you to take the historical imagery back to the old oil painting era; there was a really wide range of ideal body type there. Skinny wasn't pretty in a lot of cultures. Great analysis! EXCEPT I've always had a "Twiggy-like" body, it's just my natural body type, and some girls' too! So be careful not to commit the subtle mistake of disqualifying thinnes either, (or any other type) cause young girls could start feelling ashamed of it too, just support the idea of the value and beauty of natural uniqueness! 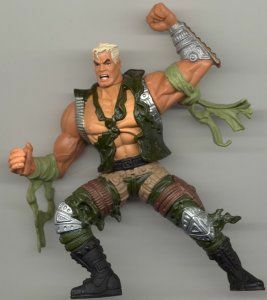 Dave Barry referred to this male ideal action figure as "Testosterone Bob". Body dysmorphia is getting weirder for both sexes all the time. Until recently I thought that steroid use was the pinnacle for men, but then I learned about Synthol. I'd wondered when men would get an equivalent to silicone implants, and here it is: an utterly unsafe substance injected, illegally, to bulk up the muscles. Google it and be horrified. This is a fantastic article, with one tiiiiny error, and I only mention it because someone will use it to claim that your entire piece is wrong - that second shot of Brad Pitt is not from Fight Club. Great article... me w/the curves of MM. Just need to correct 1 thing... the 2nd picture of Brad Pitt is not Fight Club, but Troy where he "beefed up" his physic. In almost all of Brad's movies he is a firm, fat free man w/well defined muscles. He has very high tone, and no body fat, good genes. In fight club his look more toned, but the character played off that, if you look at Ed Norton's physic & his statements in the commentary about how he felt he should appear. As an occupational therapist I see many injuries & poor body building habits of men try fit the perfect image... so many over work themselves & look funny as well as cannot reach various body parts. Great article! It had never occurred to me that the divergence of men and women's tastes was a new thing, I wonder if it has really never happened before in physicality... it certainly happened long ago in fashion. One nitpick... the second image of Brad Pitt is from Troy, not Fight Club. I can't take this post seriously with regard to mens body image. The acceptance of chest hair alone has veered wildly in the past 30 years. I saw halle berry in person about 10 years ago during her xmen days. she didnt need digital film or photoshop help. she really was that stunning. I just want to say that the only thing I think you made a mistake about was when you said that people knew that they couldn't look like Halle Barry. How is anyone supposed to know that she's all photoshopped in a movie or in posters? People think that's real! I swear. I would have had no idea. It's not common knowledge that it's photoshopped to take out the inregularities. Other than that, good observations. I still think it's disgusting that the majority of the population in the world has to have a handful of people being held up as the ideal. It's ridiculous. There are as many shapes and sizes as there are people and they are all unique. A culture that causes inferiority complexes is a disgrace. Every actor and actress should be different. Celebrate uniqueness. I would much prefer Ursula's body. Halle Barry is too skinny. I see what you are trying to say, but the average 13-year-old does not have that kind of discernment. What she sees is an image of what she is supposed to look like, and she is not thinking at all in terms of archetypal constructs. Your averager person on the street, even, does not think that way. They see a picture of an emaciated girl with large breasts and they don't think to themselves, "Ah! That is a document of what is beautiful." They look at an image of Halley Barry, and they think that's really what she looks like, even in her pajamas, and they feel bad about themselves. If this were not so, we would have far fewer eating disorders, and plastic surgeons would be making far less money. So I'm afraid I would have to respectfully disagree with you on all counts. The intention may be as you say, but the results are nowhere near. About the fourth paragraph: I was saying that the ideal of one generation tended to be passed on genetically to the next generation, and then that generation's ideal would be different, so their genes no longer worked. For example, from 1950 to 1980, women's unrestricted waist measurements (as seen in proportion to their bust and hip measurements)grew by something like 20%. This is not merely an obesity effect, but an effect of tiny waists no longer being an ideal. And about Halle Barry: I did not say definitively that she is retouched, only that she has the option of benefiting from modern technology, where Ursula Andress did not. Modern technology also allows people like Barry to make use of exercise machines, plastic surgery, and any number of other things, that weren't available in the 1960s -- if they want to (and very few still images are actually left alone these days). Amazing article! Thank you for posting this. Heya, I just stumbled across your blog. You have some really good stuff here, you should update more often. Great analysis! The mirror of ideals doesn't reflect our image, but the way the comercial advertisers want us to look. They are repeating sertant messages so often till they become true.